Is there a point in music when the phrase “too much of a good thing” applies? Certainly not when it comes to Mozart. 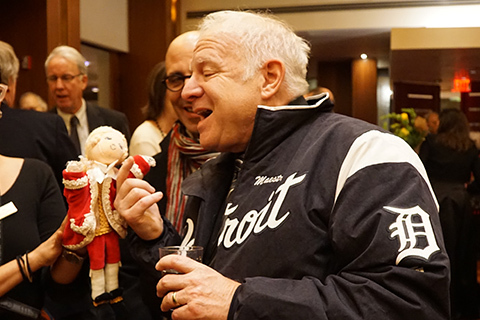 The great Austrian was the focus of our Winter Music Festival, previously inhabited by Beethoven, Tchaikovsky and Brahms. But there was also a week when the DSO played out in the neighborhoods, and that is where we start this month’s entry. For the past six seasons, a great deal of time has been spent performing in outlying communities, away from the grandeur of Orchestra Hall. There remain members of the public who either are unable to travel from the suburbs or still harbor apprehension about coming downtown. Over the course of our series, many of these people have been so taken by the orchestra that they have indeed started to visit The Max again. Getting to know a different audience is always valuable. Full houses greet us, whether we are playing in an actual auditorium, temple or church. Acoustics vary wildly, but there is no question that the value of our concerts is reaching an ever-growing public. For my week, we had music by Mendelssohn, Brahms and Smetana. There was a strong degree of familiarity for the orchestra, but the “Reformation” is a bit of a rarity these days. I don’t understand why, as it is a wonderful piece, certainly equal to Mendelssohn’s other later symphonies. 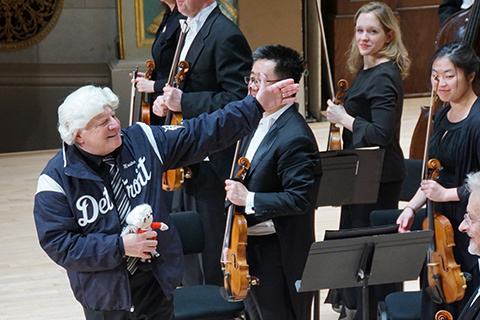 The curiosity on the program was a piece for Violin and Orchestra called Tangos Concertantes by the Argentine-American composer Lalo Schifrin. Yes, he is the same one who wrote the Mission Impossible theme, but his youth was filled with classical music study, and he was also closely associated with the king of the tango, Astor Piazzolla. Both of these influences are clearly evident in his piece, with the violin getting a major workout, especially with cascades of double-stops. Cho-Liang Lin was our soloist, and he is always a delight to work with. We did have one opportunity to play this program in Orchestra Hall, so both downtown and the suburbs were served. Then it was non-stop Mozart for three weeks. Establishing these festivals in Detroit is among the initiatives of which I am proudest. They provide a chance for the orchestra and audience to be immersed in the world of a single theme or composer. With the previous bashes, we could do whole cycles of symphonies. That was simply not possible with Mozart, as there was not enough time to put all of his works in that form into the compact rehearsal and concert schedule. But still, I was determined to come up with underlying themes that would provide anyone who attended all six programs with a satisfying and, at least, semi-complete experience. 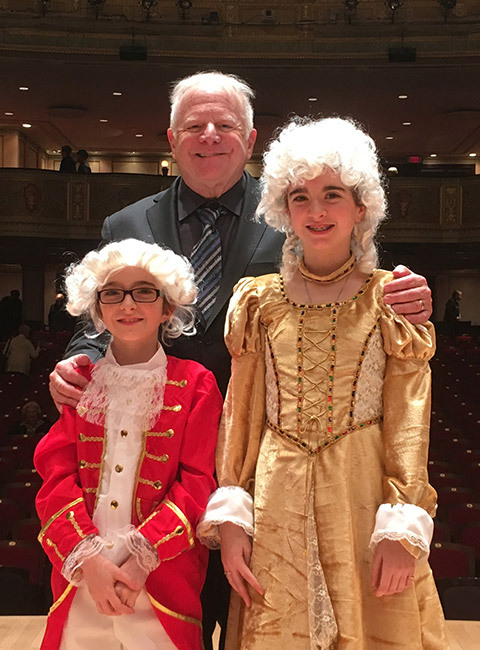 Given the unbelievable wealth of talent within the DSO ranks, I decided to perform all of Mozart’s concerti for wind instruments and orchestra. This meant one each for flute, oboe, clarinet, and bassoon. We also presented the four concerti for French horns, each performed by a different member of our section. As an added enhancement, we played the Sinfonia Concertante for violin and viola, the Concertone for two violins, and the flute and harp concerto. If you want to know what happened to the Sinfonia Concertante for winds, you will have to search my last entry to learn why it was omitted. Everyone from the orchestra shined in their places front and center. As the festival moved forward, audiences started treating them like rock stars, with not only standing ovations, but also cheering and yelling. You would have thought that Lady Gaga was entering the stage. I could not be more proud of each of our orchestra soloists, and in some ways, spotlighting them is even more pleasing than performing these works with established stars in the field. Not that the rest of the orchestra had a lesser role. With six symphonies, six overtures and Eine kleine Nachtmusik, they certainly had their work cut out for them. But after a couple days, we had established the kind of sound and style that would sustain us through the whole festival. By the time we got to the third week, everyone was so familiar with what I was going to do or say that we simply adjusted, and everything went by with incredible intensity and energy. 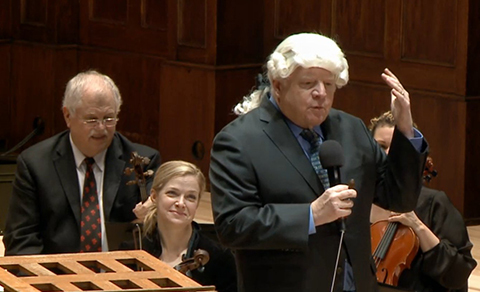 At the final rehearsal I said to the DSO, “I am not sure if I have made you a better Mozart orchestra, but I do know that you have made me a better Mozart conductor.” It is true. I learned so much from my musicians, most of which will remain with me for future encounters with the Austrian master. The music portion really started before the first program in the hall. Over in our other performance space at The Max, The Cube, all 19 of Mozart’s piano sonatas were presented, each played by students from music departments around the area. 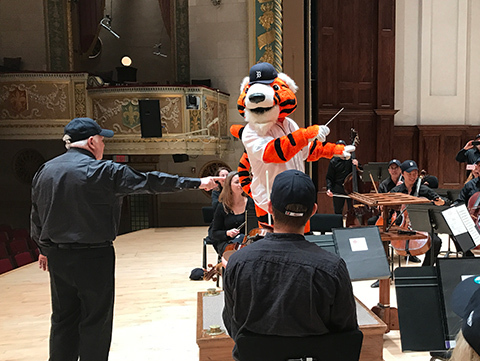 Around lunch time, the Detroit Tigers, our baseball team, arrived at Orchestra Hall. Twelve of the players, along with their general manager, came onstage, sat in vacant chairs and were handed instruments. Our musicians spent a few minutes showing them the basic mechanics of how to make a sound. I took the podium and proceeded to demonstrate how a conductor is similar to the manager of the team. We worked for a couple minutes on just producing a sound together. Then I improvised some gestures and had the entire set of forces try to figure out what I was doing. 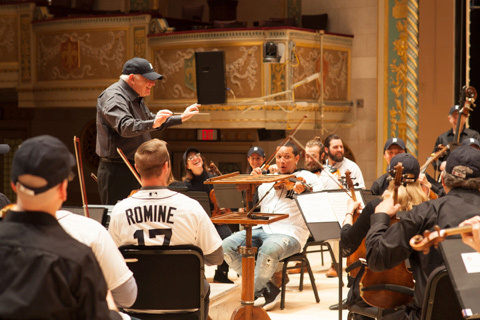 The piece de resistance was when I had the All-Star first baseman, Miguel Cabrera, take my place at the podium, and he threw himself into the conductor’s role. When he concluded, he gave me his signature pat on the backside, and all of a sudden, I became the first conductor to appear on ESPN. The team and orchestra adjourned to The Cube, where one of the young pianists played about a minute or so from one of the sonatas. After that, Tigers pitcher Daniel Norris went to the piano, and with the aid of some stickies attached to the keys, played “Twinkle, Twinkle, Little Star,” which also exists as a set of variations by Mozart. I sat down next to the hurler and interspersed some harmonies. The festival was indeed off to a great start, and the pace and level of enjoyment continued unabated throughout. It all ended with a performance of the Requiem, played by our Detroit Symphony Youth Orchestra and the University of Michigan Choir. It was all exhilarating but exhausting, in some ways more demanding than any of the previous festivals. I came away with much more clarity about Mozart, and these weeks helped me define the composer in a much more complete way than I imagined. The sheer variety of his output, the clever use of counterpoint and the occasional cheeky dissonance all came together for me. My already high esteem for him reached a new level, and it will be impossible to forget what occurred over these three weeks. Now we go back to France for a week in preparation for the ONL’s U.S. tour. Check the calendar so you can see where we will be. Hope to see you at a concert, and if not, I will certainly see you here next month.